Colorful leaves, cozy vibes and marvelous weather make autumn one of the best times shop and dine in New York City! On Madison Ave., Spain-based wedding dress designer Pronovias has taken a second Midtown spot at 45 East 58th St. between Madison and Park Aves. Reformation leased 1055 Madison Ave. at 81st St., previously Joe Fresh. On Fifth Ave., L’Occitane unveiled jawdropping concept store at 555 Fifth Ave. as an immersive destination with a wide range of interactive touchpoints.On the Upper East Side, Bloomingdale’s, 59th and Lexington Ave., opened The Carousel, hosting a rotating curated pop-up shop with unique products and in-store activations; every two months there will be a new experience programmed by a different guest curator. On the Upper West Side, Design Within Reach to have a new store at 2162 Broadway between West 77th and West 76th Sts. In TriBeCa, cult Instagram beverage company favored by fashion influencers, Dirty Lemon’s Drug Store open at 293 Church St. and fun fact, it is cashierless. In the West Village, cashmere specialist Naadam opening a store at 392 Bleecker St. Margaux fine women’s shoes replaced Mulberry at 387 Bleecker St. Prabal Gurung will unveil his first store at 367 and 369 Bleecker St. Netluxe joins the neighborhood at 345 Bleecker St. coming to bricks and mortar with a pop –up offering top designers, sample sales and luxury brands and goldno.8, 332 Bleecker St., allows you to design your own bag. In SoHo, Australian wedding dress designer Grace Loves Lace, will open its first NYC location, 43 Wooster St. Danish electronics company Bang & Olufsen joins the tech set Sonos, Bose, Devialet and Apple at 121 Spring St. Microsoft to have a flagship retail store at 300 Lafayette St. while Google opening an outpost at 131 Greene St. Italian clothing company Redemption to 102 Wooster St. Preview at 134 Prince St., brings an array of popular online and lifestyle athletic apparel, technology, and wellness brands. Gracious Home continuing its comeback 498 Broome St. Lululemon is adding a yoga studio to 520 Broadway. Sandro changed locations now coined SoHo Pop Up on 79 Greene St. In NoLIta, Fancy.com’s first permanent retail store, 57 Bond St. is focused on exclusivity, collaborations and sneaker collectors. In the Meatpacking District, Restoration Hardware (RH) debuted their new flagship RH New York, The Gallery at the intersection of Little West 12th St., Ninth Ave. and Gansevoort St., 9 Ninth Ave., and has six floors dedicated to RH Interiors, Modern, Outdoor, Baby & Child, Teen and Interior Design and a Rooftop Restaurant & Wine Terrace as well as a Barista Bar.In the Lower East Side, Paris-based contemporary menswear label 13 Bonaparte has opened its first permanent City store at 1 Rivington St. Depop, a British app that fashion-savvy millennials use to buy and sell both new and vintage clothing, went “clicks to bricks” now at 168 Mott St. In the Financial District, Madewell will join sister brand J. Crew at Brookfield Place, 200 Vesey St., in the space formerly occupied by Diane von Furstenberg, between Michael Kors and Paul Smith for its eighth location in the city. In SouthSt. Seaport, Italian luxury concept fashion store 10 Corso Como opened their doors at the Seaport on the first floor of the Fulton Market Building at 1 Fulton St. This marks an important milestone for the neighborhood’s transformation into a fashion, cultural, culinary and entertainment hub. Featuring an Italian café/restaurant, fashion, design objects and books, beauty, a garden, and an art gallery with “Shop in Shop” boutique brands such asComme des Garçons, Maison Margiela, exclusive Gucci, Balenciaga and Prada. To perfectly compliment your shopping adventures let’s see what’s new to eat……Benno in the Evelyn Hotel, 7 East 27th St., by chef Jonathan Benno formerly of Per Se and Lincoln, is a Mediterranean fine-dining venue attached to his more casual, Roman-themed Leonelli Taberna. Bluebird London at Time Warner Center, 10 Columbus Circle, is a modern European/British brasserie by British restaurant group D&D. Also at Time Warner Center, Momofuku Noodle Bar by David Chang, will have a fresh take on his downtown classic. La Rossa at 267 Lafayette St.by Roman pizzaiolo Stefano Callegari, will serve pizza “al taglio;” traditional rectangular Roman pies that are served in slices and sold by weight. You can also dine on round pies, salads, antipasti, and Roman snacks. Llama San, 359 Sixth Ave., by Chef Erik Ramirez and business partner Juan Correa, is a West Village Nikkei restaurant serving Japanese-Peruvian cuisine. Madame Vo BBQ, 104 Second Ave., by husband-and-wife team Yen Vo & Chef Jimmy Ly creators of Madame Vo nearby, now introduce Vietnamese barbecue, where diners use electric infrared tabletop grills similar to those found in Japanese and Korean restaurants- typically a celebratory food in Vietnam. Morgenstern’s Finest Ice Cream, 88 W. Houston St., is Nick Morgenstern’s new flagship, about four times the size of the original, featuring five scooping stations versus two and 88 flavors available and a production kitchen in the service of a whole new slew of ice-cream offerings. Zauo,152 West 24th St., by Noriki Takahashi and his sons Kazuhisa and Takuya Sure, lets you fish for your dinner using poles from a real boat inside a moat. The catch is then sliced to be served as sushi or grilled or tempura-fried. Fall is fabulous in the Big Apple and this year’s new and anticipated shopping and dining options don’t disappoint! 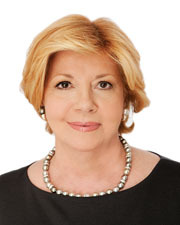 Faith Hope Consolo is the chairman of Douglas Elliman’s retail leasing and sales division, New York, N.Y.